I don't know why the NCAA always does this, but every year on the third day of the tournament, they have one game on by its lonesome in the 1:00 p.m. slot... and then they triple us up at around 5:45. Why? We see less basketball this way. Is it so west coasters don't have more than one game on at 10:00 a.m.? And if so, can you really pretend to give a damn about the west coast if you're airing any games at all in that time slot? You're either making them get up at 10 in the morning, or you're not. I don't see how this does anyone any good. Anyway, that's what we're dealing with. Unless it runs really late, everyone's getting Ohio State vs. Xavier in its entirety. Maybe it's better this way; it brings us all closer together. So let's make the most of this communal experience, and let's bond here in the open thread. 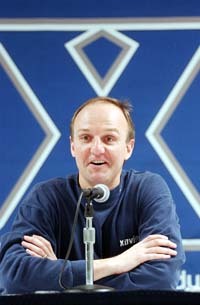 And hey, anyone remember where Thad Matta coached before he came to Ohio State? I can't remember. I think it started with an 'X'.